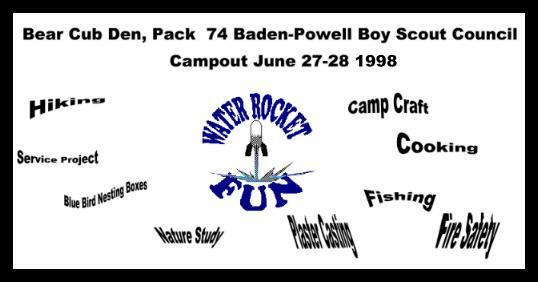 There were three Cub Scout water rocket flights in 1998 by the Bear Den, Pack 74, Baden Powell Council, Boy Scouts of America. All three flights were in rockets made from 2 liter soda bottles. Fins were taped to the sides. 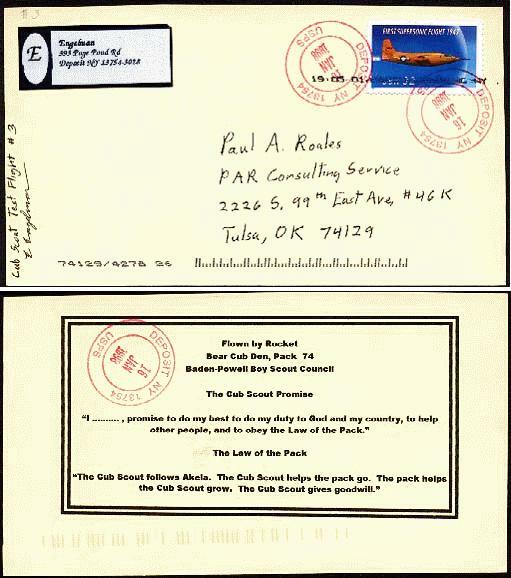 The messages/covers were placed in a zip lock bag and taped to the sides. The bottles were partially filled with water and then the bottle was pressurized with a foot operated air pump. The rockets rose 40 to 60 feet above ground level. A parachute was used to slow the decent. One was a test flight in my back yard. Of the three flights this was the only one where the items were mailed. The third flight was held during a Cub Scout overnight where each Cub Scout built his rocket. The flown message included an image of a water rocket and a listing of the activities on the overnight. Special Thanks to Ed Engelman for sharing his experiences!